Bhai Phota(Bhai Duj in parts of Northern India) does not hold any emotional bonding for me. I have no brothers of my own, boy cousins were few & far, my Ma did not encourage neighborhood brother hood and so you are spared any sob story I might have. But Bhai Phota was still something to look forward to because my Mamas(mother's brother), two of them would rarely miss a Bhai Phota and even catch the overnight train to get the dot smeared on their forehead by their sister, my mom. In anticipation of their arrival my Ma would knead, pound, chop, fry and turn up one dish after other. Dry sweets and savories like nimki, pyarakia would be done before hand and available for sampling a day ahead of Bhai Phota. On the day itself there would be more cooking and eating. For the uninitiated let me tell you, Bhai Phota or Bhatri Dwitiya is the bengali version of the more well known Hindu festival Bhai Duj where in the sister puts a tilak(a dot) on the brother's forehead and prays for his long life while the brother does something like gifts etc. in return. 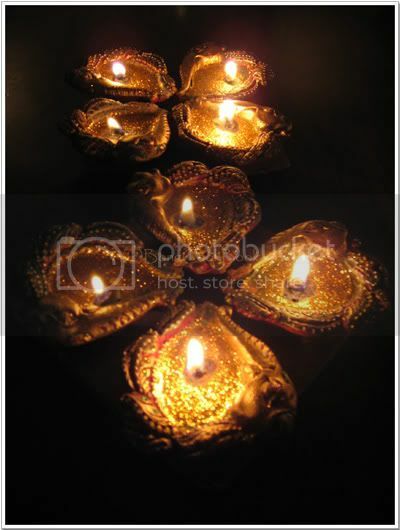 The "Duj" comes from the fact that this is celebrated exactly two days after new moon, on the Dwitiya right after Diwali. This is akin to Rakhi but I guess the mythical stories associated with both are different. Anyway the Bengali Male likes the Bhai Phota much better than Rakhi. He doesn't have the Rajpoot brother's bravado to promise life long protection to his sisters as on Rakhi.Instead he is happy being smeared with sandalwood paste, eating the delicacies, giving the sister a gift and then returning home with the shirt piece from Raymond's. The Bong sister on the other hand keeps her fast, does the cooking, puts a dot of sandalwood paste on her brother's forehead and secures her brother's future by sealing Yama's door. It doesn't matter that soon after she plies her brother with cholesterol laden fried goodies and shoves numerous sweets down his throat. The Bong male when still a kid will go around the neighborhood, getting "phota" from 'hood sisters of myriad ages. In fact the demand for brothers is so high that D says, lunch and dinners would be booked in advance while all other time slots would be devoted to just being "dotted" and snacks. With such a deluge of sisters it is amazing that the Bong Male is successful in even procuring a wife in later life. To keep the essence of Bhai Phota alive, my two little daughters give Bhai Phota to their cousin brothers, the two cute twins of my friend N. This time Bhai Phota being on a working Monday we had the ceremony at their home. I made Paayesh -- Param-anna, the food of Gods. I also made a Murg Makhani while the rest of the delicious dishes were made by N's Mom. I did not have Khejur Gur and since I am not too fond of Paayesh without the Khejur Gur flavor I was a little weary. The Paayesh turned out wonderful though. I used a few cardamoms this time and I also added a few strands of Saffron towards the very end. 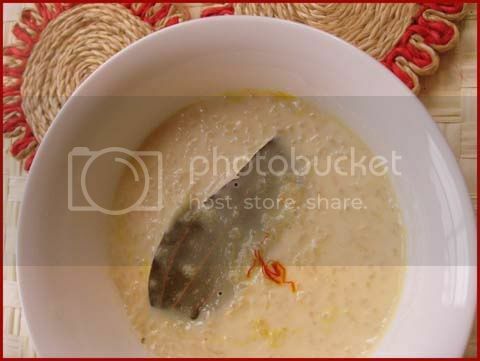 The saffron made it look very pretty and also lend a very nice flavor to the Payesh. 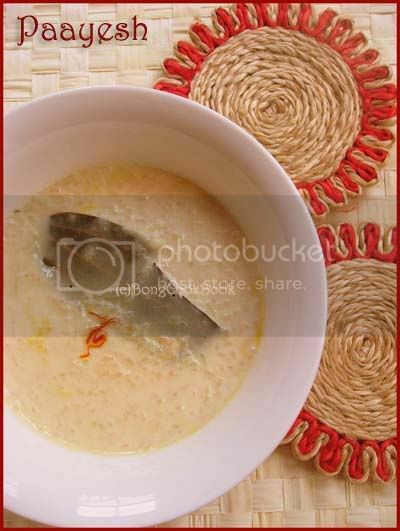 The recipe for Paayesh is exactly like the one I have before(Khejur Gur er Payesh). The subtle changes I made were as follows. At the very fag end of the process, I added a few strands of saffron to the paayesh. This is just a "Hello" post with no pics. I haven't had any time to post and my Bhai Phota(Bhai Duj) post is languishing in the draft dungeon. I will be back soon, maybe in a couple of days. Meanwhile have been eating a lot, a lot. That is what happens when you have too many festivals all conveniently scattered over a single month. Back from a Diwali party of Chole-Puri, Pav-Bhaji, Rasmalai and assorted tid-bits late Saturday night, Sunday we were all ready to go to a lunch spread of Cholar Dal, Enchor-Chingri, Maacher Kalia, maccher matha diye Bandhakopi and the works. Then Sunday evening was a birthday party. This one was special because the hostess is a super cook. Her mutton biryani is US famous if not the world. It was only sheer gastronomic power that made me down two plates of that heavenly biryani even after a late lunch. I couldn't even look at the numerous other items on the buffet table. What helped afterward is her Masala Sprite, a lovely drink which makes you feel it is digestive(?) and triggers your brain to eat more biryani. First know what is Sprite. You might have been born to someone like me who deprives their child of such pleasures. Pour sprite carefully in a glass. This can get tricky. Too much will cause overflow and too little dissatisfaction. And lets raise a glass of Masala Sprite to Desi Pundit. I have been invited as a community member to their community -- "a community of top-notch desi blogs, based on consistently creative writing, distinct opinions, and user-friendly design" and I will share some of my selected posts with them in the future. Thanks to Patrix and the team at Desi Pundit for the invite. Nupur's this post had opened up the beautiful new world of Food Memoirs to me. And I couldn't think of a better opportunity than Sra's The Write Taste, to share these gems with you. I am not much of a cookbook reader. Cookbooks are too much of a burden, they make me feel very, what do you say "lacking". I cannot read a cookbook at leisure, I feel I need to get up and stir something up from the book, I feel I owe that to the authors and that takes away the charm of relaxed reading. The food memoirs on the other hand are simply beautiful. You get to delve into food intertwined with life and that is like sitting by your grandma, listening to her stories while she kneads the dough, rolls it out, stuffs it with spiced pea mix and fries up puffed karaishuti'r kachuri while all you do is take in the smell, the taste and the stories without lifting a finger. It all started with Ruth Reichl's "Tender on the Bone". Honestly I hadn't heard of Ruth Reichl before and when I turned the first page there were no expectations. The first page after I was a huge fan and had researched her head to toe on the internet.To read more about this famous food persona go here. I will leave you with an excerpt. "Most mornings I got out of bed and went to the refrigerator to see how my mother was feeling. You could tell instantly, just by opening the door. One day in 1960 I found a whole suckling pig staring at me. I jumped back and slammed the door hard. I had never seen a whole animal in our refrigerator before, even the chicken cam in parts. He was surrounded by tiny crab apples and a whole wreath of vegetables. This was not a bad sign: the more odd and interesting things in the refrigerator, the happier my Mother was likely to be." Next was Madhur Jaffrey's "Climbing The Mango Trees". Now Madhur Jaffrey I knew, from movies and from her cookbooks. Only I hadn't really thumbed any of her cookbooks. This book however is a beautiful read, you are transported into pre-Independence era Delhi and Kanpur and you get to peep into the life, times and food of an Indian family heavily influenced by the West and yet firmly rooted to the Indian culture. "The Lady in White was the color of milk. What mattered most to us, though, was not her milky color but the milky ambrosia that she carried on her head. Those cups were the first things placed before us at breakfast that day. Our spoons, provided by the Lady in White, were the traditional flat pieces of bamboo. Heavenly froth, tasting a bit of the bamboo, a bit of the terra-cotta, a bit sweet and a bit nutty—surely this was the food of angels." Thanks Nupur for the wonderful reads and thanks to Sra for an opportunity to share. 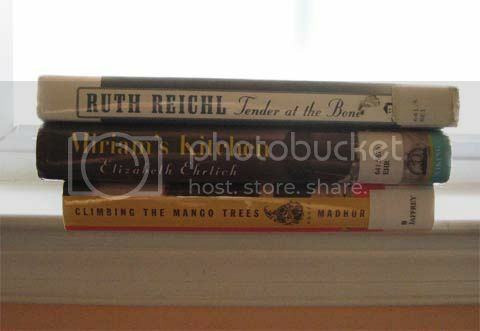 Looking forward to reading more of Ruth Reichl over the next months only my reading is hugely slowed down by lack of time and I keep on renewing these books over & over. In the process I keep coming back and re-reading them again but the charm is there each time, every time. 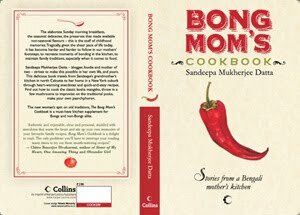 What are your favorite Food Memoirs ?